Nokia announced the Lumia 920, their first Windows Mobile 8 phone, it will be a thing of beauty. Motorola announed the Razr HD, also a thing of beauty. Then Apple announced the iPhone 5. As part of the announcement for the iPhone 5, iOS 6 was introduced. iOS 6 is now the operating system for Apple gadgets (i.e., iPad, iPod, and iPhone) including some older generations. 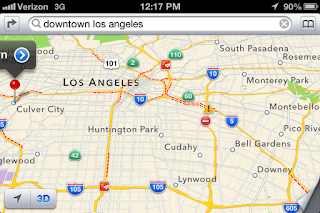 The biggest change in iOS 6 was the addition of Apple's own Maps app. Since there is only room for one native Maps app that meant, goodbye to Google Maps. After using Apple Maps for two days here are three quick thoughts. Thought 1: Overall this is a better mapping experience simply because of the addition of turn-by-turn navigation and its integration with Siri. The first thing I did to test out the new Maps app was to ask Siri, "Directions to the nearest Target". I knew the directions, which made it a great test. And it worked! After I asked Siri my query, I was being fed correct turn-by-turn information. Thought 2: There are still many flaws with the new Apple Maps, even when compared to the gimped Google Maps app we had on our Apple devices. Google has a seemingly infinite amount of street data. Their street view library is uncanny, now that option is gone. Street view is an essensial part of my mapping experience since I like to know what my final destination is going to look like. The traffic layer on the Apple Maps is horrendous. There is just a dotted red line to signify traffic. So for me in Los Angeles, this tells me nothing during rush hour, just a sea of dotted red lines. Google Maps gives out green, yellow, and red highlights for traffic. Apple needs to add the equivalent of the yellow highlight. Moreover, Apple hardly has data on street traffic, this is another essential part of a Maps since freeways are jammed during rush hour. Lastly, even the search results are questionable on the new Apple Maps, look at the picture above. I searched for downtown LA and Apple Maps pinned an area in West LA near Culver City, which is clearly not downtown Los Angeles. These are just gripes in the United States. The gaps in the amount of street data Google has outside of the US versus what Apple has is even wider. People outside the United States switching to Apple Maps will have more complaints. Thought 3: The full version of Google Maps is transparently better than this first attempt from Apple. Too bad you can only get the full Google Maps experience on an Android phone. To summarize, I barely prefer the new Apple Maps to the gimped version of Google Maps, but I wish that I could use the full version of Google Maps on my iPhone.